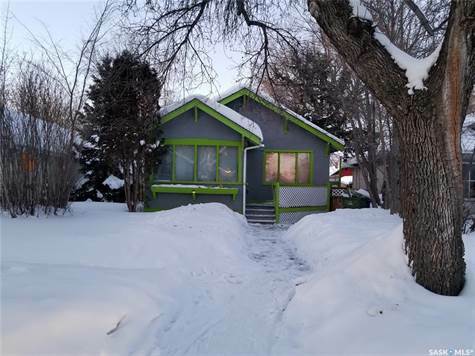 Garage: "Garage: 1 Car Detached; Parking Space(s): 2"
Basement: Yes, Full "Walls: Concrete"
Lot Size: 41ft x 122.1ft "Lane, Rectangular"
Attractive 2 +1 bedroom bungalow in Midtown area. This home features hardwood floors in living room and dining area, linoleum in the kitchen with newer appliances included. Handy front porch/sunroom is heated from the living room and expands the living space. High efficiency furnace was added in late 2014. Side deck with 2 levels and a good sized fully fenced yard are great for kids and pets. The fence can be opened at the back by the single detached garage to allow for additional small vehicle/equipment storage. Garage is used for storage and would need updating to be used for a vehicle. Independently Owned and Operated. ®/™ trademarks owned by Century 21 Real Estate LLC used under license or authorized sub-license. © 2012 Century 21 Canada Limited Partnership Information is deemed to be correct but not guaranteed.